wonder what the mystery accessories are. Nice. Link is definitely bought if I see him. I hope we get a Kirby. saw Mario and Yoshi at target the other night. Someone on fwoosh apparently found 4" Link in the US at Target already. And not sure but unless it is the mystery accessory seems like Link doesn't have a shield. Still day 1, but why couldn't we have had a line like this when I was a kid? They showed a prototype of OOT Ganondorf at Toyfair. Samus and such are coming. Last edited by Specter; 08-03-2014 at 08:20 PM..
Are they Figma size? If not, then these mean nothing to me. 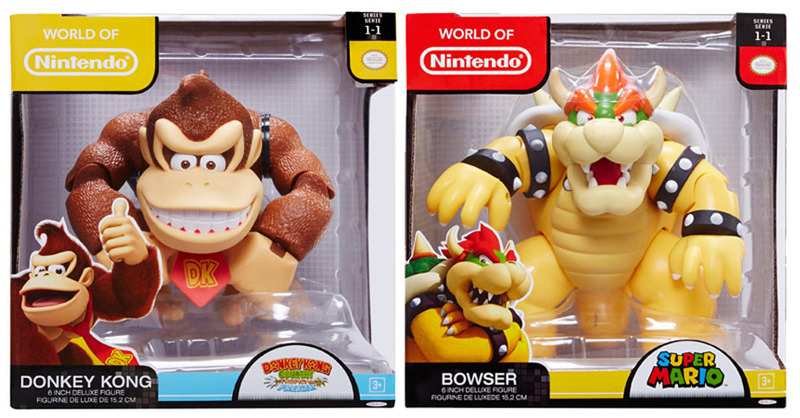 I found the DK and Bowser last week at TRU. Posted pics a few days ago in the "Look what I passed up" thread. 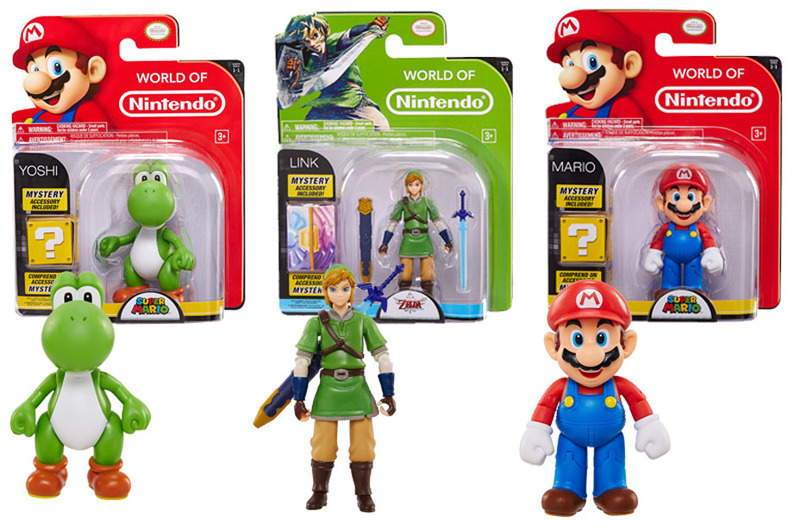 They look okay, anyone know the scale, do they fit with the FIgma link and Samus? I do know that Bowser looks great with Figuarts Mario. 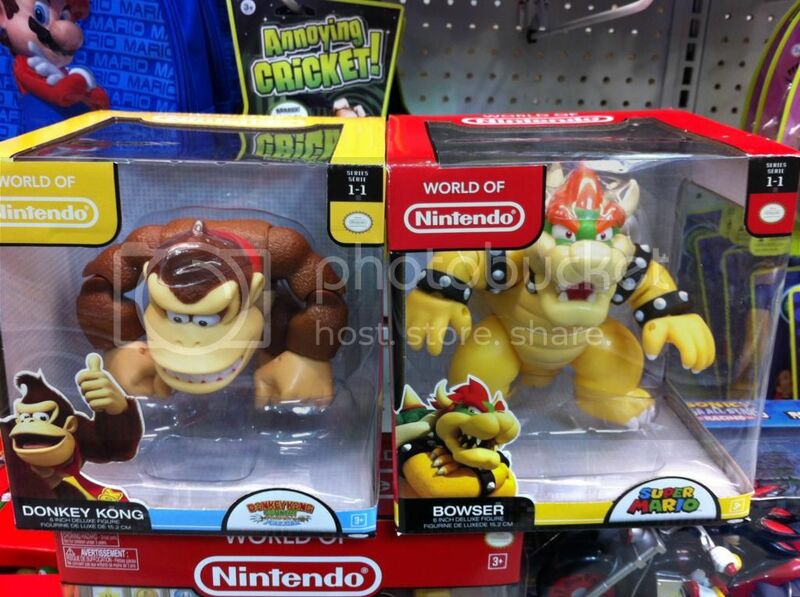 Someone has a collection pic on a different site, Bowser looks decent sized compared to Link. Samus is hard to tell. The 4" Link will likely be way too small(Figma is 5.46"), Mario and Yoshi might sense they are oversized short characters but we need in hand pics to know. 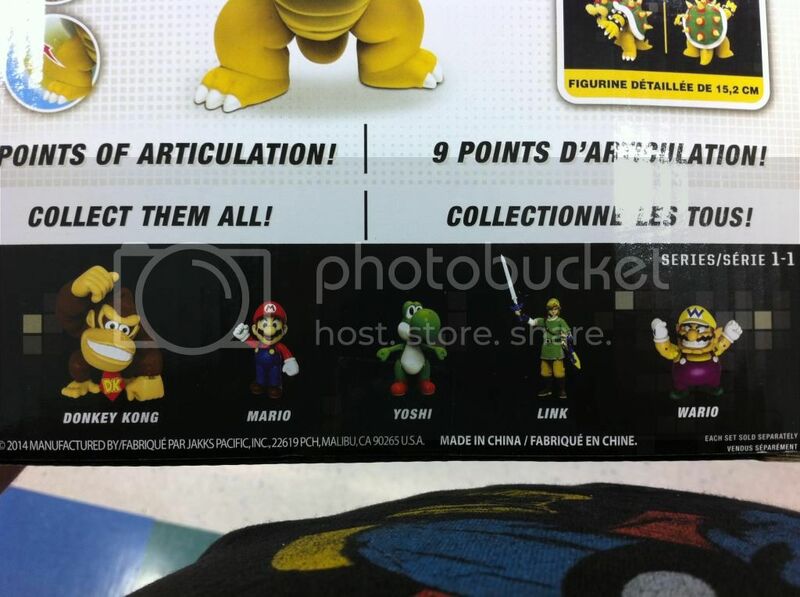 Last edited by Specter; 08-03-2014 at 10:07 PM..
Mario, Yoshi and Link are all 4", while Bowser and DK are 6". Link's hidden item is indeed his shield, mushroom for Mario and egg for Yoshi. I think I like these better than the figurearts Mario. Those things feel so cheap and fragile, I hate how hollow they feel, at least based on the Mega Man figurearts I had. These Jakks figures look much more solid. I'll sacrifice some articulation if it means the figure will not fall apart if I look at it wrong. Last edited by SteveGo; 08-03-2014 at 10:07 PM.. Does Link have knee joints? Last edited by Specter; 08-03-2014 at 10:12 PM..
Can't say, I don't have him yet. Although someone posted the back of a Link in package and it mentioned 13 points of articulation. They mentioned they got it at Target for $8.99. Can't wait until they do Samus. That's the one I'll pick up. 4'' preferred. Captain Falcon & some other F-Zero pilots would be fun!! Captain Falcon is definitely coming in the 2" line. don't know about further 4" waves yet. Star Fox would be epic. Jakks Pacific is just killing it these days. They need to make there own brand of action figures and see where it leads them. I'm going to stop after work to see if I can grab these. Do up a comparison shoot with the SH Figuarts Mario. Don't they already have some of these characters in that scale? Star Fox would be epic. Jakks Pacific is just killing it these days. 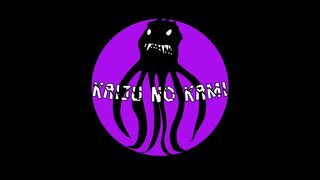 Starfox is supposedly planned for the 2" line. might see him and a ship in the MicroLand sku. Last edited by Specter; 08-04-2014 at 08:04 AM..
Hmm the Link and Mario look cool. May need to check Target. Anyone have the DCPI/Target Item number for these? I didn't see them at my local store, but if someone can provide the DCPI, I can look them up via the in-store scanner to see if they have them.